A small window into my heart. I love Jesus. First off let me start off by making a thousand excuses to why I haven’t been blogging, haha! In case you didn’t know, we sold our house of 10 years last September. Yes, 10 years! It was bittersweet for sure. When my husband and I bought that house we were newlyweds. We had been married for just one year. We were a couple of 22 year olds that decided to move to Texas, all the way from Southern California. We bought our 4 bedroom home, dreaming of one day filling it up with a family. We bought it October 2005. Well almost exactly 10 years later, a family of six by then, moved out. We knew it was time to move out, we had outgrown it and well, the greenbelt just didn’t work for us. It was so beautiful to look at but the snakes were not child friendly and this city girl hated it! Still, that house was our only home. I brought my babies home from the hospital to that house. I remember creating their nurseries. I remember every single birthday, Thanksgiving and Christmas in that house. It is the longest I had ever been in one home. Growing up we moved a lot. At least once a year until I got to High School and my parents bought a house. So you can see why I cherish those memories so much. We had just finished an entire first floor remodel too, so leaving my beautiful new kitchen wasn’t fun. But to be honest, there was a sigh of relief when we finally moved out. Not just because the move was brutal with 4 kids (hehe), it isn’t easy selling a home in Dallas and making a profit. Right now it is a sellers market so it was definitely the right time to sell financially. And God’s favor was definitely evident. So for now, we moved into a short term rental until we figure out what the next step is. We moved to a new development, a three story townhouse. Let me just tell you these darn stairs were killing me the first few weeks, haha! I was exhausted and hauling 18 lbs on my hip every time I went up or down was not helping. It was great exercise though! There’s always a positive I guess, you just have to find it and focus on that. Okay so we moved late September. A week later was my oldest son’s 9th Birthday. We had a small party with just family and he got a more expensive gift (his choice) which was fine with me because a week later was my daughter’s 1st Birthday and I knew I had tons to plan! It was crazy actually. I had a week to make all her decorations since I didn’t order anything ahead of time and I couldn’t find what I wanted at a local store, I pretty much made everything myself. It turned out beautiful! I was so happy with the way it all turned out. I did a girly tea party, my momma came early and helped me prep the food and I made the cake. Like seriously, that was insane. I loved how it turned out but yikes, I might have been a little too ambitious, lol! Okay so two weeks after that was our trip to Brazil. Yes, Brazil! We decided just four weeks before that we would attempt a trip half way around the world with our four kids. That was an adventure in itself, I will have to do a whole post just on Brazil soon! I got back from Brazil on Thursday, Saturday I left to California for a late Birthday trip with my sister. I will have to do a post on California soon too! This time it was just my sister and I while my hubby stood home with the kids. Even the baby! I weaned her off breastmilk the week before Brazil, so it was so weird leaving her! She’s been attached to me for the last two years! It was so much fun but I missed her so much. I am so in love with my kids, I came back so ready to keep loving them and serving them! So I came back and princess had a little cold. She’s been pretty cranky and super attached to momma these past few days. She’s also getting three molars at once so that doesn’t help either. Today she is doing a little better so I am attempting to start this blog and hopefully finish it soon! Life should get a little more normal now. Other than the holidays of course :) So I hope to start blogging again at least once a week. Okay I am done giving you an account of the last two months! Ha! But as you can see, it’s been pretty hectic. For now I leave you with a picture of one of my favorite fall pieces! 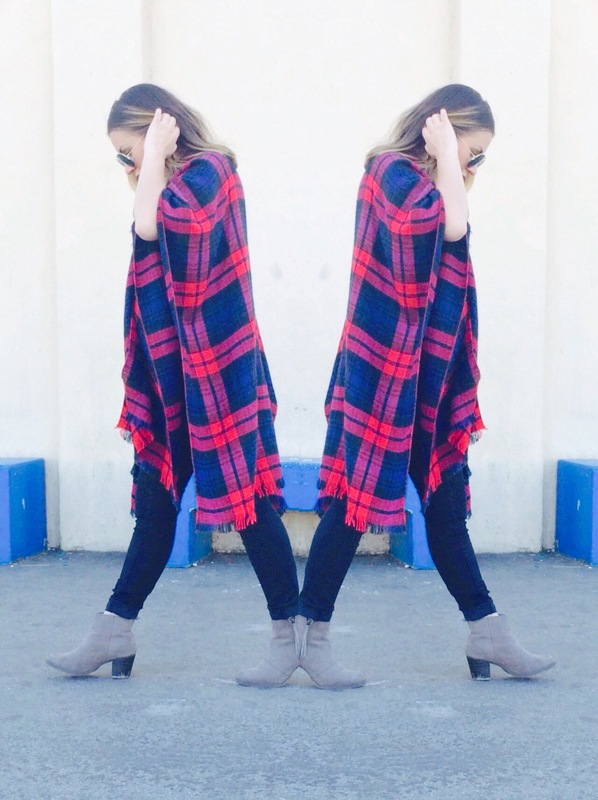 I am in love with ponchos and oversized scarves! They are so comfy and easy to wear and they make any outfit look more stylish. 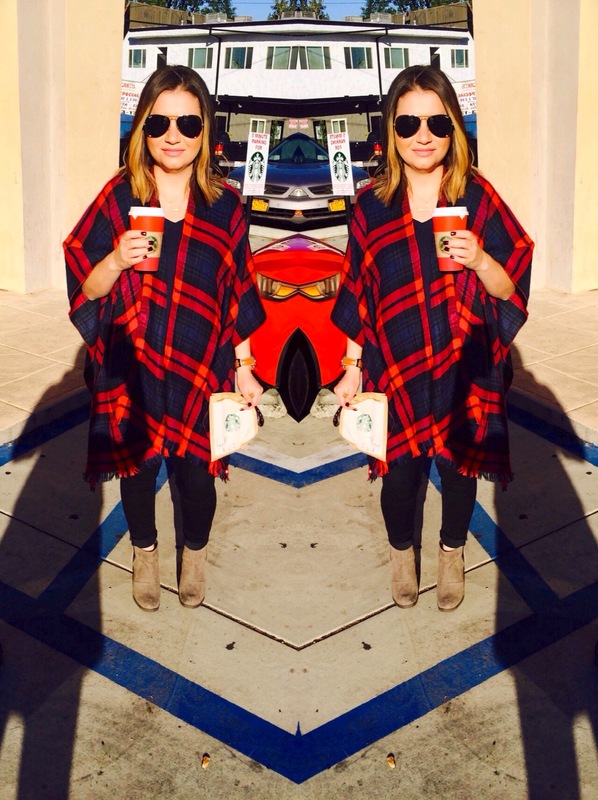 This red and blue poncho has become a favorite of mine because of the vibrant colors. Photo credit goes to my sister, she takes the best pictures and I wish I could take her everywhere I go. She is also my hairstylist. She does amazing color! If you want her information send me a message and I would be glad to share! LOVE that poncho! Also, love YOU! Thx doll! Love YOU right back!